YUP, it’s another sheet pan recipe! It seems I just can’t help myself. I figure you can’t serve your turkey roulade without a hefty slice of something sweet alongside, amiright? When making a galette, keep in mind: perfection is not the goal. Galettes are forgiving. Messy is fine. We can call it “rustic” and serve it for company. 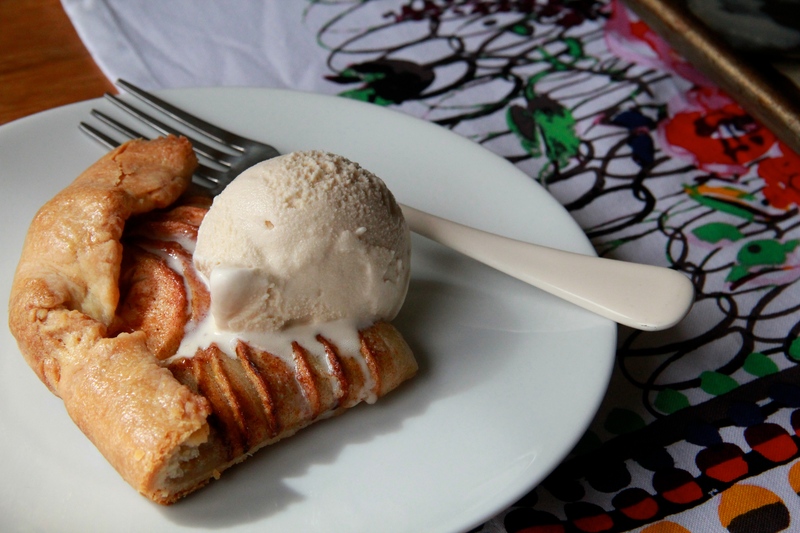 Tender crust, warm apples with sugar and spice, all topped with a pile of melting ice cream (or whipped cream, as the case may be)? Let’s do this. I’ve got so much to be thankful for this year, starting with a fat slice of apple galette and ending with a new cookbook, new husband and, not least of all, my ever-amazing group of family and friends (including you!) — thank you, thank you all. If you don’t feel like making your own pie dough here, you could substitute store-bought puff pastry — but instead of folding the sides over to make the crust, simply score the border with a sharp knife and arrange the apples inside the border. The puff pastry will puff up (duh) to form a rough crust. Easy! To make the dough, place the flour, salt, and 1 tablespoon of the sugar in a food processor. Pulse for about 5 seconds to combine. Add the unsalted butter and pulse about 10 times, until the butter has been processed into bits of various sizes. Pour the cold water down the feed tube, then pulse the mixture until the dough starts to come together. Preheat the oven to 400 degrees F with a rack in the center position. Line a sheet pan with parchment paper. Clean and generously flour the work surface and rolling pin. Unwrap the dough, set it on the surface, and roll it out to a 15-by-12-inch rectangle, about 1/4-inch thick. Carefully transfer the dough to the prepared pan, handling it gently. Place the pan, uncovered, in the refrigerator or freezer, to firm up the dough while you prepare the apple filling, about 10 minutes. Peel, core, and slice the apples into 1/4-inch-thick slices. Place the slices in a large bowl, drizzle the lemon juice over them, and toss very gently to coat. Mix together the cinnamon, nutmeg, and the remaining 1/3 cup sugar in a small bowl. Remove the dough from the refrigerator or freezer. 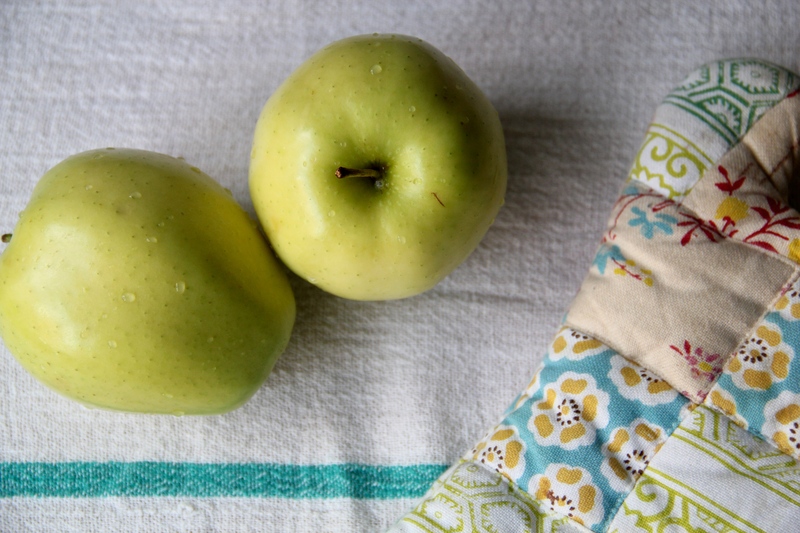 Arrange the apple slices in tight, overlapping rows down the middle of the rectangle, leaving a 1-inch border on all sides. Generously sprinkle the apples with the sugar mixture and dot them with the salted butter. 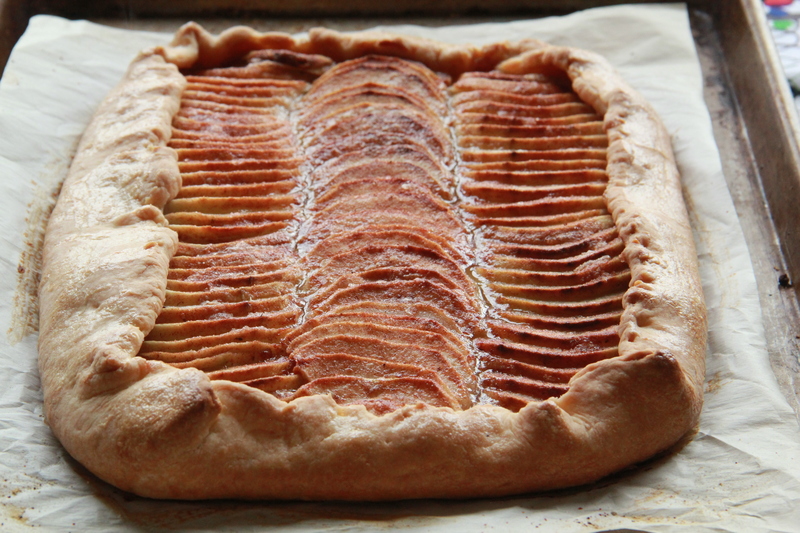 Fold the dough border over the apples, overlapping it where necessary, to create a free-form crust. Brush the exposed crust with the beaten egg. 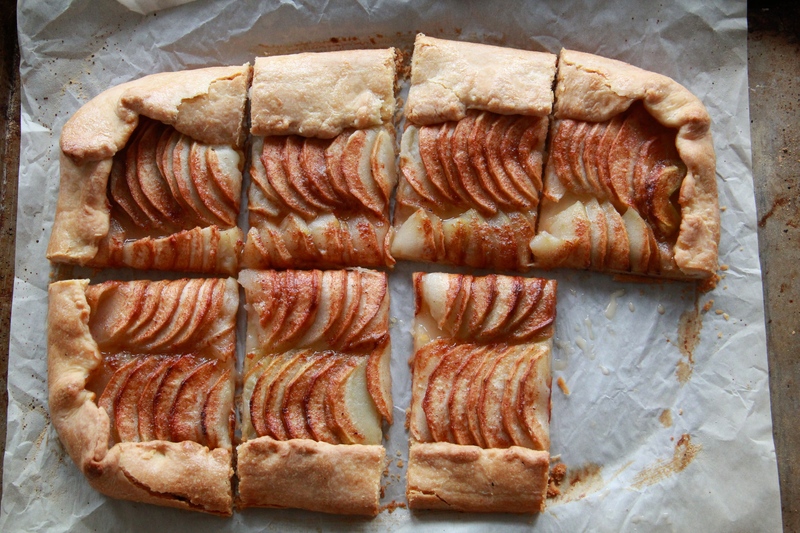 Bake the galette until both the crust and apple edges are deeply brown, 45 to 60 minutes. Let the galette cool for 5 minutes. While the galette is cooling, combine the apricot jam with 2 tablespoons of water in a small saucepan over medium heat and whisk until smooth. Brush the apples with the apricot glaze. Allow the glaze to set until no longer runny, about 10 minutes. 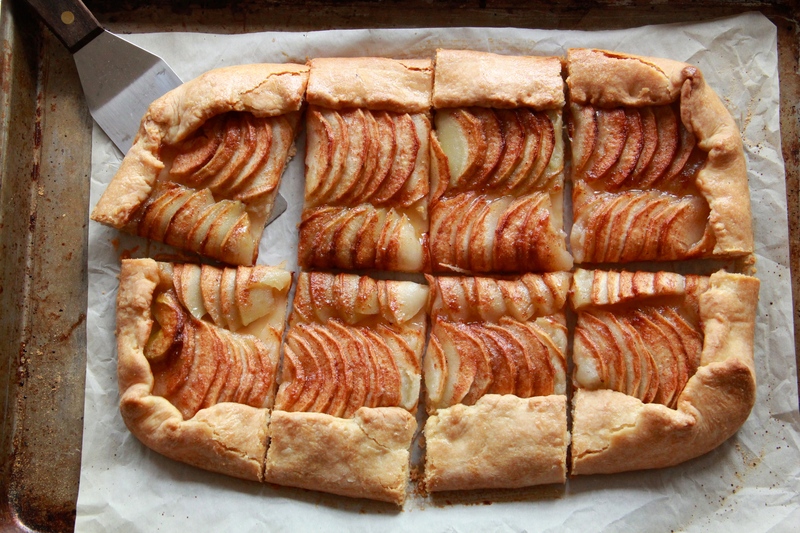 Slice the galette into big squares and serve it warm with generous scoops of ice cream. The galette also does well at room temperature alongside some coffee or tea.